Espresso ﻿﻿﻿machin﻿﻿﻿es are a godsend for all coffee lovers out there. Nespresso makes some of the best espresso machines on the market. They were the first ones to introduce an espresso machine that can produce 7.8 oz. of coffee at one time. This system is called the VertuoLine system and it has gained quite some popularity particularly in the US and Europe. Nespresso machines are also distinctive in that they come with a unique blend of coffee capsules. These Nespresso capsules capture the true essence of coffee and are available in a number of exciting flavors. Nespresso is a business unit of Nestlé, which is a brand that needs no introduction. Nespresso is dedicated to producing high-quality espresso machines and introducing new technologies in the field. The company is a frontrunner in the espresso machine market and is in fact, one of the first companies to introduce the pod coffee concept to the world. While Nespresso joined hands with other manufacturing companies like Krups, Miele, Delonghi, Siemens, and Magimix to make its first espresso machines, in 2000 the company launched its very own line of espresso machines that held the Nespresso patent technology. The company offers more than 15 espresso machines today that suit different needs and pockets. The Vertuoline machines are far more advanced and give you the option of brewing a 7.8 oz. cup, a 8 oz. cup, or a 1.4 oz. cup of coffee. These also come packed with a new technology that uses "centrifusion" to ground the coffee and mix it in with water. These machines also use specialized Nespresso capsules that come with a barcode. The machines read these barcodes to gauge the size of the cup, the temperature needed to brew the coffee, the rotational speed required, the flow rate, and the amount of time the water will be in contact with the coffee. The Nespresso Vertuoline has three amazing espresso machines that let you brew your favorite flavor coffee blends in the size you want. The Vertuoline, Evoluo, and Vertuoplus are all remarkable machines that use the latest technology in the market to make delicious blends of coffee. However, these machines are a little pricey and they can only brew Nespresso Vertuoline capsules, which we shall discuss later in this article. Since the two types of espresso machines offered by Nespresso use such different technologies, the coffee capsules for each of them are also different. Nespresso urges buyers to use their patented capsules to brew coffee in their machines. They also state that you should buy these capsules from their official website. Unfortunately, their website doesn’t ship worldwide. This means that you need to find another place to get your hands on these capsules or risk going coffee free. This is especially important if you have one of the Vertuoline machines since they can’t brew coffee from any other brand. The only downside is that you might not be able to find every flavor of Nespresso capsules on Amazon and the quantity that you can buy at one time may be limited. As we mentioned before, Nespresso capsules come in two different categories; the Vertuoline capsules and the Originalline capsules. Both these categories house a number of different blends. The Virtuoline blends are a lot more straightforward in their flavor profile and the few experimental blends in this line fare well among the coffee lovers. This relatively new line is ever expanding and Nespresso keeps on adding new, bolder flavors to this line. The Originalline has a lot more flavors to offer and features blends from all over the world. These Nespresso capsules range from strong to mild in flavor and there is something for everyone in this category. We have tried quite a lot of these Nespresso capsules ourselves and have chosen our favorites. Read on to find out our top 5 Nespresso capsule flavors and the one we just can’t live without. Hailing from the Intenso line of Nespresso Originalline capsules, Arpeggio is a strong and creamy concoction that has a rich taste. This blend is one of our favorites because it has just the right intensity to wake you up in the morning and give you that refreshing feeling. Arpeggio is made from a blend of Central and South American Arabicas and has a slight cocoa and woody undertone that counters its intense flavor and gives it a unique quality. This coffee has hints of the infamous Costa Rican flavors and has an aroma that boasts grilled notes. It is made by grinding the beans really finely and then roasting them intensely to bring out that rich, strong flavor. We love the flavor of this blend and the fact that it has just the right intensity to give you that coffee kick but is still a concoction that can be reveled in just for its taste and aroma. However, as with all other coffees in the Intenso line, Arpeggio packs a little more intensity than your regular cup of coffee. So, if you’re not a fan of strong flavors, this might not be the right choice for you. Volluto is the kind of coffee you can fall in love with instantly. As a member of the Espresso line of the Nespresso Originalline capsules, this sweet and light coffee is perfect for drinking in the middle of the day or on a day out with friends. Volluto is a blend that is put together with the utmost care and respect. The Brazilian and Columbian Arabicas that go into making this wonderful coffee are produced in one of the hubs of coffee plantations. The coffee is made by lightly roasting the ground beans. This is done to preserve the Brazilian cereal notes and the Columbian fruity ones. Volluto is one aromatic cup of coffee; it has a diverse range of scents, ranging from fruity and sweet notes to slightly acidic biscuity notes. The acidic edge in its aroma can also be tasted in the coffee itself and it lifts the flavor profile of this coffee. We love that this is a light, fruity blend that captures the essence of what coffee is all about and is the perfect concoction for whenever you feel like having something light. However, this isn’t as strong as your regular cup of coffee and is more like a light, sweet, fruity drink that has coffee undertones. If you like your coffee strong this might not be the right choice for you. If you like your coffee strong and spicy, then Indriya is right up your alley. Nespresso launched its Pure Origin Capsules line to explore the different coffee regions and extract unique blends that are representative of the best flavors of their country of origin. Indriya pays homage to the strong, spicy flavors of India by being a drink that has a strong character. Indriya is made from a blend of Arabica and Robusta cultivated in Southern India. These coffee beans are grown on high altitude plantations covered with the shade of trees to really infuse the strong, slightly bitter taste. The beans are ground finely and roasted separately to get just the right flavor. The Arabica is roasted lightly to preserve its light aroma, whereas the Robusta is heavily roasted to bring out its intensity. This coffee smells like a spicy bouquet with undertones that resemble that of nutmeg, cloves, and pepper. We love that this coffee has just the right blend of earthy woody flavor with a spicy, bitter undertone. Even a small cup of this coffee is enough to jar your senses. However, this coffee isn’t for everyone. Its intense flavor and aroma may be too much for those who don’t like their coffee strong. Fortissio Lungo is a coffee best described as a malty, slightly bitter, aromatic concoction that is just the perfect blend of strong and flavorful. As part of the Lungo Capsule line of the Nespresso Originalline capsules, Fortissio does an amazing job of being an espresso that is intense but still palatable. This coffee is made from a blend that is as diverse as its flavor. West Indian Malabar Arabica is harvested and then exposed to monsoon winds to really bring out a rich aromatic profile complete with cereal notes. To add intensity, Latin American Arabica is then added to this blend. Both Arabicas go through a split roasting process so that they maintain their individual flavor profiles and one doesn’t overshadow the other. This coffee has a rich and intense aroma that is sweet and malty and pleasantly bitter at the same time. We love that this coffee combines the strong punch of an espresso with a wholesome flavor profile. However, these capsules come in a Lungo 4 oz. size which is bigger than a standard espresso cup. So brew this whenever you feel like drinking a large cup of intense coffee. Odacio is another strong coffee with a fruity twist. A capsule that belongs to the Vertuoline Nespresso category, Odacio presents a flavor that is intense and rich but still retains some fruity undertones. This delicious coffee is bold and lively with a taste that is versatile to say the least. Odacio is made with two Arabicas from different continents; the Nicaragua Arabica is long roasted to bring out the intensity and structure of the base flavor, whereas the Ethiopia Arabica is lightly roasted to preserve its delicate fruity flavor. On face value, these two Arabicas have vastly different flavors but somehow they seem to work perfectly with each other. While one gives structure and robustness to the coffee, the other softens the edges with its mild undertones. This coffee has an intense aroma that sways between spicy, tangy, and sweet tones. This is achieved by a longer pre-wetting time and a high temperature. Meanwhile, the flow is kept at an intermediate level to keep the delicate flavor of the East African beans. We love that this coffee is just the right blend of bold and smooth. We get the punch of intense flavor but then a softer aftertaste that makes this an interesting drink. However, you can only use this capsule if you have a Nespresso Vertuoline machine at home. While we are in love with most of the flavors Nespresso capsules offer, our all-time favorite is Fortissio Lungo. We adore this coffee because it packs the regular espresso punch that we so direly need every morning but it also has such a versatile flavor profile that we enjoy sipping every last drop just for the taste. The aroma starts off intense but gradually reveals different undertones, which is a pleasant little surprise. This diversity in flavor ensures that we aren’t enjoying just any cup of coffee but a premium blend. 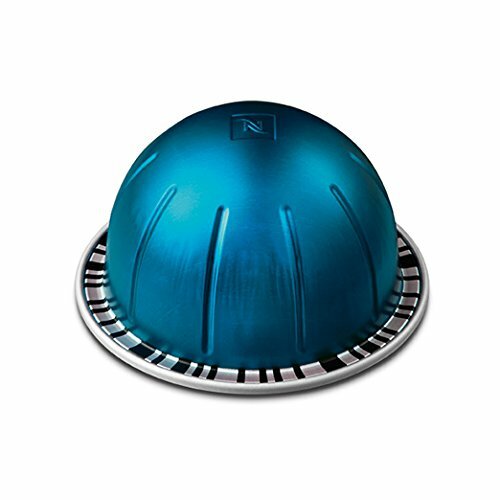 Have you tried other Nespresso capsule flavors? Let us know your thoughts and comments below.